ABC Russian: What is the difference between Russian words Зачем? и Почему? What is the difference between Russian words Зачем? и Почему? One English «why?» can be translated into Russian as «Зачем»? и «Почему»? So, what is the difference? Sometimes this difference gets too slight and can be neglected, especially in the colloquial speech, the two words can be used interchangeably. But there are some contexts when they cannot be substituted with each other. Each action, event or situation has some cause, but not each one has some rational goal. Sometimes a cause may be interpreted as a goal, but sometimes it isn't true. Therefore, words "зачем" and "почему" aren't totally interchangeable. As usual there are no problems with usage of «Почему» because you can express it easily with the English question word«why»? Why is red wine healthier than white? Почему красное вино полезнее белого? Why is the earth round? Почему Земля круглая? As a rule there are a lot of problems using the Russian «Зачем»? Some students totally do not understand how to use this weird Russian question word. What is the difference between Зачем? и Почему? Зачем? - why? for what purpose? It presupposes some goal. Почему? - why? for what reason? It presupposes some cause. Russian word "Зачем" is to be used in situations related with events or actions caused by somebody (зачем он это сделал? - why did he do that? ), or in some philosophical context (зачем существует человек? ~ what is the goal of human's existence?). When you ask what a thing is used for, you should use only «зачем»? Зачем нужна эта штука? "What is this thing used for?" Я знаю, что я должен это сделать, но зачем? - I know I have to do this, but what for? Russian word «Зачем»? cannot be used when asking about some actions that have no purpose. 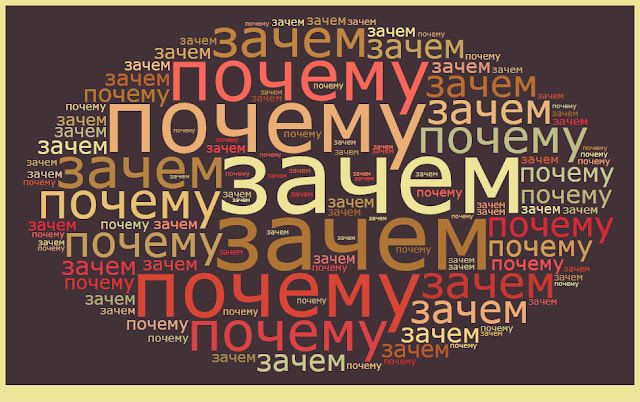 However, "почему" can be used more widely. Почему солнце встает на востоке? - Why does sun rises in the east? Почему он не сдал экзамены? - Why didn't he pass the exams?